A Sinhala military intelligence operative attached to the occupying Sri Lanka Navy (SLN) in Arippu, a coastal village in the Musali division of Mannaar district was caught red-handed by Tamil fishermen Tuesday around 10:00 p.m. when he was harassing a family in the village. The military intelligence operative was beaten up by the angry villagers. The SL Navy sailors stationed at the naval detachment in Arippu tried to rescue the culprit by sending an SLN sailor. When the attempt failed, the navy sailor escaped from the villagers, who chased him to the naval detachment. The navy personnel threatened the villagers by firing gunshots. However, the angry villagers smashed the SL Navy detachment sending a strong message against the criminal conduct of the occupying navy. Catholic priests in Mannaar told TamilNet that they have managed to calm down the villagers. Tension prevails in the area. Vicar General of Mannaar Diocese Fr Victor Sosai and Vanni District TNA Parliamentarian Charles Nirmalanathan rushed to St Mary's Church and joined the parish priest to bring the situation under control. 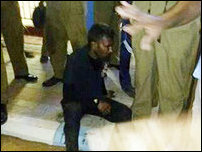 The apprehended Sinhala soldier was brought to the church premises by the villagers. The villagers demanded the presence of Mannaar Senior Superindent of Police and deployment of police personnel around their village before handing over the captured Sinhala intelligence operative to the SL Police. 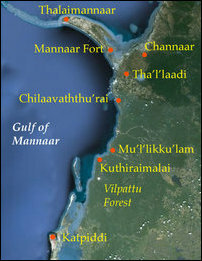 Arippu, also known as Muthu-aripputh-thu'rai, is located north of Chilaavaththu'rai. SL Navy and Army bases are shown in red. Arippu is the largest coastal village in the Musali division with Tamil Catholic population situated close to Chilaavaththu'rai. The Tamil fishermen in Arippu complain that the Sinhala Navy personnel have been harassing their families during the nights. The villagers also blamed that the SL Navy personnel were complicit in theft and other crimes taking place in the night time in their village. The strategically situated coastal division of Musali, facing both the Palk Bay and the Gulf of Mannaar as well as commanding the closest communication line with the Tamil Nadu coast, has become a hive of intense Sinhala militarisation and demographic changes in recent times. There are large SL military establishments at Chilaavaththu'rai and at Mu'l'lik-ku'lam. Mu'l'ikku'lam has become a strategic point of occupation to the SL Navy that aim to Sinhalicise and colonise the land and the historic waters of Eezham Tamils. More than 4,500 Eezham Tamil civilians, evicted from Musali division in Mannnaar district in September 2007, are still refused entry to their village by the occupying SLN, which has transformed Mu'l'likku'lam into the so-called ‘Command Headquarters’ of the ‘North Western Naval Area’. 01.10.16 People rise up against occupation of Vidaththal-theevu at DD..
09.09.16 Uprooted people from Pa'l'li-munai secure interim order agai..
13.02.16 SL Navy brutally assaults Tamil fishermen from Mannaar near ..